Desmodium aparines (Link) DC., Desmodium hjalmarsonii (Schindl.) Standl., Desmodium trigonum DC., Hedysarum intortum Miller, Meibomia intorta, Meibomia hjalmarsonii Schindl. Greenleaf desmodium (Desmodium intortum (Mill.) Urb.) is a large perennial (pluri-annual) tropical forage legume. It is a branched decumbent plant with long trailing and climbing pubescent stems that root at the nodes. The stems are green or sometimes red, 1.5 to 7.5 m long and about 7 mm in diameter. Greenleaf desmodium has many trifoliate leaves. The leaflets are ovate, 2-7 cm long x 1.5-5.5 cm broad, reddish-brown to purple in colour. The flowers are borne on terminal compact racemes, deep lilac to deep pink in colour. The pods are narrow, segmented, 5 cm long and contain 8 to 12 kidney-shaped seeds that adhere strongly to hair or clothing. The seeds are about 3 mm long x 1.5 mm wide. Greenleaf desmodium is leafier than silverleaf desmodium (Desmodium uncinatum (Jacq.) DC. ), with rounder leaflets (USDA NRCS, 2012; Cook et al., 2005; Skerman, 1982). 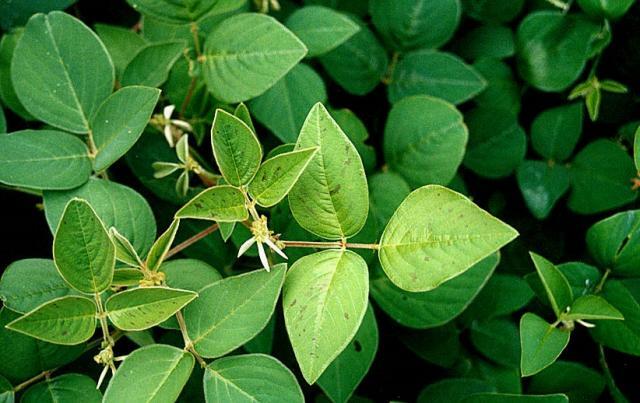 Greenleaf desmodium is mainly used as a fodder legume. It can be grazed as a long-term pasture, cut and offered fresh in cut-and-carry systems, or cut from irrigated pastures for conservation as hay or silage. It is a valuable ground cover providing abundant leaf material that decomposes slowly in the soil (Cook et al., 2005). Greenleaf desmodium originated from Central and North-Western South America (Panama, Colombia, Guatemala, Venezuela, Ecuador, Peru) and is now widespread throughout the tropics. It became naturalized in small areas of the higher rainfall subtropics and elevated tropics. In South-East Asia, it occurs in Papua New Guinea, the Philippines and Thailand. In Australia, it can be grown in wetter areas (Ecocrop, 2014; Cook et al., 2005; Hacker, 1992; Skerman, 1982). Greenleaf desmodium is a summer growing perennial. Optimal temperature ranges between 25 and 30°C. It can be found between 30°N and 30°S, from sea level in the subtropics to an altitude of 2500 m. It does better at altitudes between 500 and 2500 m in the tropics. It grows well on slopes. It can be grown in areas where annual rainfall is above 900 mm and up to 3000 mm. During the growing season, it is more susceptible to drought and has better tolerance of flooding and waterlogging than silverleaf desmodium (Cook et al., 2005). Greenleaf desmodium can grow on a wide range of soils provided they are not too acidic (pH above 4.5-5) and not saline. It is not tolerant of heavy frosts or fire. It is tolerant of shade and can be grown in coffee plantations (Ecocrop, 2014; Cook et al., 2005; Hacker, 1992; Skerman, 1982). DM yields of greenleaf desmodium range from 12 to 19 t/ha/year, which is higher than silverleaf desmodium (7-9 t DM/ha/year). Better yields are obtained with longer cutting intervals of 30-85 days (Ecocrop, 2014). Greenleaf desmodium has very small seeds and requires a well prepared seedbed for establishment. It can be sown from spring to midsummer or later in frost-free areas. It is possible to propagate greenleaf desmodium by rooted cuttings. Once established, greenleaf desmodium grows vigorously and spreads rapidly into ungrazed areas because of its stolons (Skerman, 1982). Greenleaf desmodium is usually sown in association with a grass or another legume. It grows well with a wide range of tussock grasses such as Setaria spp., Megathyrsus maximus, Pennisetum purpureum, Melinis minutiflora, Pennisetum clandestinum or Digitaria eriantha. 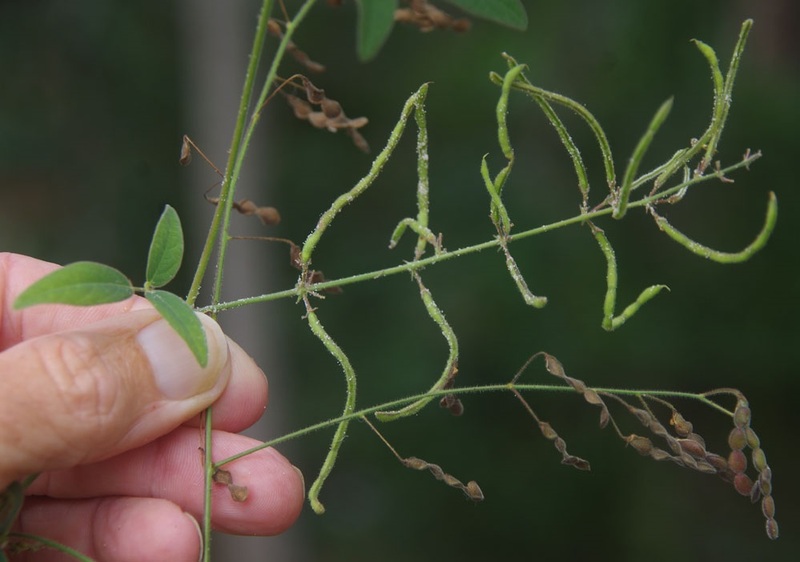 Greenleaf desmodium is a N-fixing legume that has been reported to fix 213-300 kg N/ha/year in the soil, but it transfers only 5% of this nitrogen to its companion grasses (Skerman, 1982). 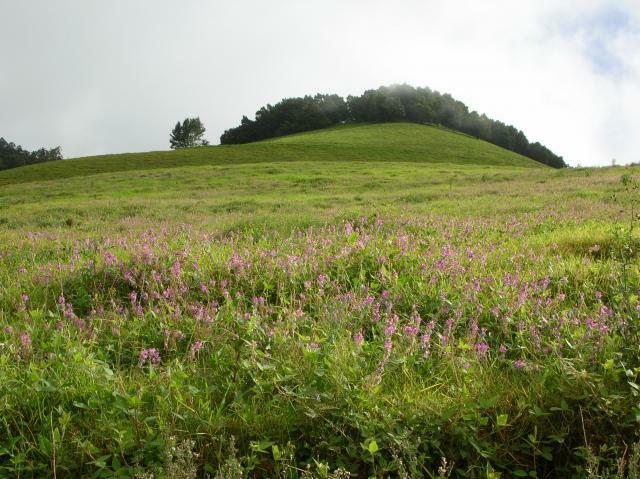 Greenleaf desmodium is generally introduced into natural pastures to increase the DM yield. In Brazil, 3 years after its introduction, greenleaf desmodium still represented 38 to 53% of the pasture (Silva et al., 1993). Greenleaf desmodium may be grown in association with Napier grass (Pennisetum purpureum) in order to increase the protein content of the stand (from 11% in a pure Napier stand to 15% in mixed sward). The in vitro OM digestibility of Napier/greenleaf forage decreased with maturity, from 70 to 56%. Yield was favoured by late cuttings (120 days), with quality (protein up to 18% DM) favoured by early cuttings (60 days) (Bayble et al., 2007). Greenleaf desmodium combines well with other legumes such as siratro (Macroptilium atropurpureum) or perennial soybean (Neonotonia wightii) (Cook et al., 2005). Greenleaf desmodium has moderate needs for added fertilizers, only P, S, K and Mo being required (Cook et al., 2005). 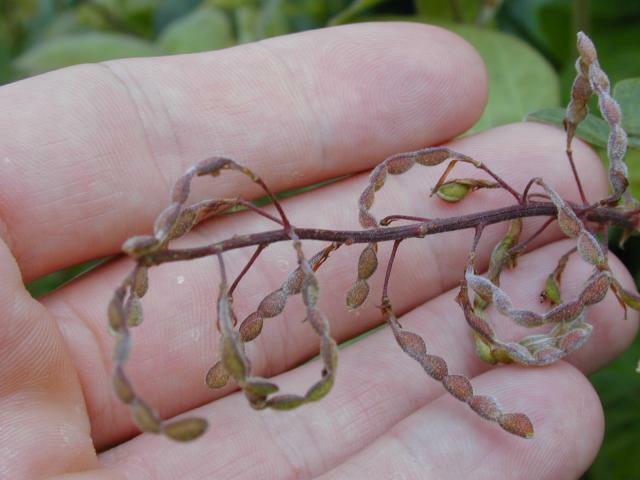 Greenleaf desmodium is susceptible to pests such as the Pyralidae caterpillars Hedylepta dnopheralis Mab. and Hedylepta indicata F., that can cause heavy losses at the end of the hot season, as experienced in the Réunion Island (Fritz et al., 1976). In Australia, larvae of the weevil Amnemus spp. may destroy the roots, impairing the persistence of greenleaf desmodium in Setaria pasture after 3-4 years (Jones et al., 2003). Greenleaf desmodium is very palatable and tends to be heavily grazed, but it cannot stand constant heavy grazing or frequent defoliation that removes the bud promoting sites (cutting heights under 7-15 cm are recommended). After grazing, there should be enough vines and leaves left to allow good regrowth. Initial grazing should be very light to permit establishment (DPI, 2004). The optimal length of the rest period is debatted, and durations from 3 to 12 weeks have been proposed (Risopoulos, 1966; Riveros et al., 1970 cited by Skerman, 1982). However, even under careful grazing management, greenleaf desmodium pastures rarely persist for more than 6 years (Cook et al., 2005). Being a late flowering species, greenleaf desmodium provides good standover feed during autumn and winter in frost-free areas (Cook et al., 2005). It can be cut for hay. Greenleaf desmodium makes good quality silage when mixed with molasses (8% fresh matter basis) (Skerman, 1982). 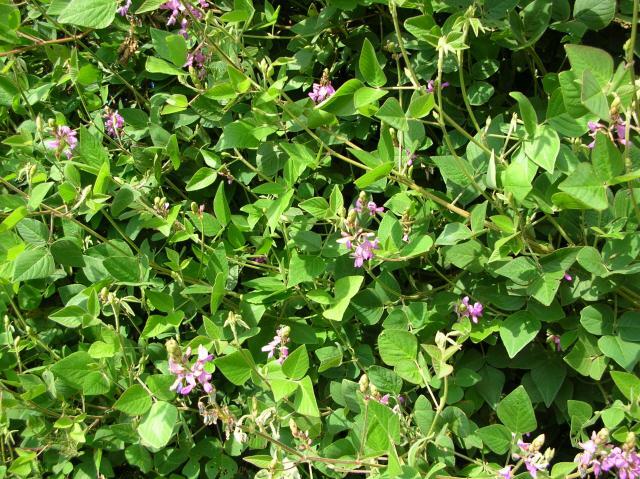 Being an N-fixing legume, greenleaf desmodium can improve soil fertility. It can be used as ground cover as it needs only 4 months to cover the soil, and to prevent weeds from developing (ILRI, 2013). It has been used as ground cover on coffee plantations (Maina et al., 2006). 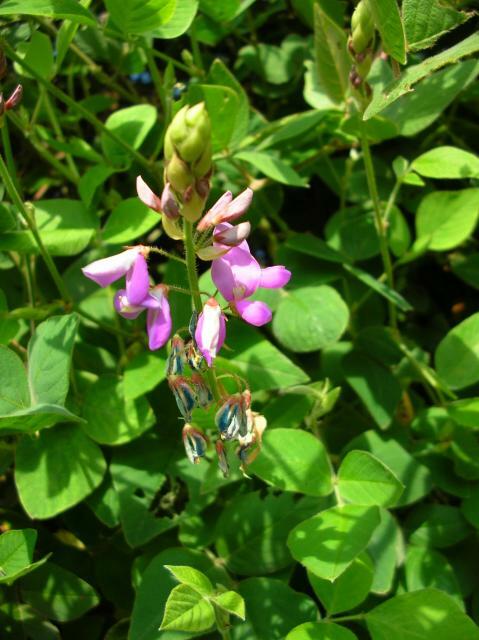 Greenleaf desmodium has a relatively poor nutritive value for a legume. Its protein content is in the 12-21% DM range, with an average of 15.5% DM, and very high levels of fibre (ADF more than 30% DM), including lignin (about 9% DM). However, this anomalous fibre level could be an artefact of the high tannin content, as it was observed in other legume species (Reed, 1986). Desmodium intortum contains phytoestrogens but not of the types responsible for reproductive problems (Wang Weiqun et al., 1994). At the time of writing, no reproductive issues due to Desmodium intortum have been reported (2014). The whole plant of greenleaf desmodium contains large amounts of condensed tannins varying from 3.2% DM (Perez-Maldonado et al., 1996) to 10-12% DM (Getachew et al., 2000; Mbugua et al., 2008). Extractable tannins measured on greenleaf desmodium hay harvested at the late flowering stage were 3.5% DM (Tolera et al., 2000a). In Kenya, total tannins (hydrolysable and condensed) in greenleaf desmodium were up to 30.3% DM (Kanga'ra, 1993). Maybe due to its high tannin content, no cases of bloat have been reported in cattle fed on greenleaf desmodium (as of 2014). Tannins have anthelmintic effects: the prolonged feeding of goats with greenleaf desmodium resulted in the lowest total worm burden and in the lowest per capita fecundity in worms. In Ethiopia, feeding greenleaf desmodium has been suggested for integrated worm management in goats (Debela et al., 2012). Greenleaf desmodium can be a valuable protein supplement in ruminant diets based on fibrous by-products or low nutritive value forages (Tolera et al., 2000b; Mwangi et al., 2003; Boukila et al., 2009). The tannins can exert beneficial effects on protein metabolism by increasing the proportion of bypass protein without limiting the ammonia N level and microbial synthesis in the rumen (Perez-Maldonado et al., 1996; Tolera et al., 2000b). Tannins in greenleaf desmodium have also been able to reduce significantly the effects of intestinal parasites (Debela et al., 2012). The DM degradability of greenleaf desmodium hay measured in the rumen was 68% within 48 h of incubation (Tolera et al., 1997). Reported digestibility values have been rather low. A 1971 study reported an OM digestibility of only 39% in sheep, but for a fresh forage of poor quality (protein 10% DM) (Holm, 1971). In vivo (sheep) apparent DM and OM digestibility of greenleaf desmodium hay (10% bloom stage) were 49% and 53% respectively (Nurfeta et al., 2009). Due to its rumen degradable protein and condensed tannins content, greenleaf desmodium provides sufficient nitrogen for both rumen microbial protein and by-pass protein (Tolera et al., 2000b). However, some condensed tannins may be complexed with either cellulose or protein, protecting linkages from cleavage and thus limiting in vitro digestibility (Ford, 1978). Whole tannins limited ruminal DM degradability to 22% compared to 56% when polyethylene glycol (PEG) was added. Total tract DM digestibility increased from 39% to 66% when PEG was added (Kanga'ra, 1993). Condensed tannins in leaves reduced both in vitro DM and protein degradability (Getachew et al., 2000). Adding PEG increased NDF digestibility (Mbugua et al., 2008). When greenleaf desmodium hay (10% bloom stage) was offered as the sole feed to male sheep with an average weight of 26.3 kg, DM intake was 70.4 g/kg W0.75 (Nurfeta et al., 2009). 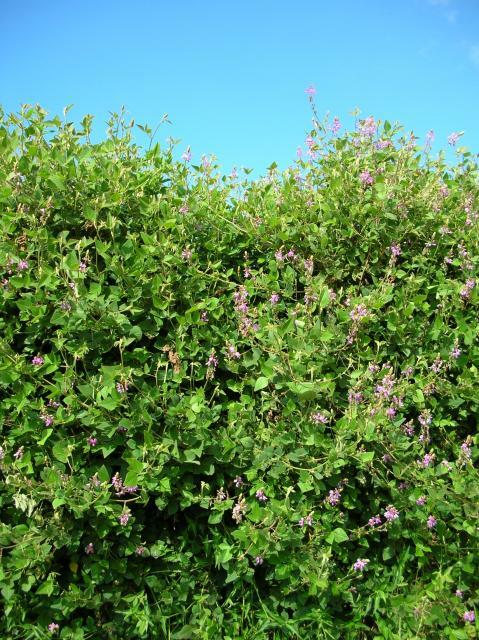 In Ethiopia, Desmodium intortum forage used as protein supplement (2 kg/d) with native grass given to pre-weaning calves (3-4 months) resulted in daily weight gain of 320 g/d (Larbi et al., 1992). In Kenya, Desmodium intortum leaves used as protein supplement (20% of DM intake) with Pennisetum purpureum grass of low nutritive value (16 week regrowth, protein 6.4% DM) for growing heifers (271 kg) resulted in a daily weight gain of 638 g/d (Kaitho et al., 1998). In growing heifers (163-181 kg), greenleaf desmodium used either as an intercrop legume or as a hay supplement, both at 30% DM, with good Pennisetum purpureum (protein 12% DM) grass, gave better growth as an intercrop than as a hay supplement (450 vs. 420 g/d) (Kariuki et al., 1999). In Australia (Queensland) greenleaf desmodium implanted in a Setaria pasture and grazed by heifers gave a daily weight gain of 182 g/d at a low stocking rate of 1.1 head/ha, but much lower growth (66 g/d) when the stocking rate was up to 3 head/ha (Jones et al., 2003). In Kenya, greenleaf desmodium, included at up to 30% of the diet for steers (411 kg) based on Pennisetum purpureum (protein 9% DM), increased the protein content of the diet from 9.1 to 11.7% DM, and significantly increased OM intake from 74 to 90 g/kg W0.75(Kariuki et al., 2001). Several sheep trials have been undertaken in Ethiopia. Greenleaf desmodium hay (protein 15.5% DM) was used as protein supplement in sheep diets based on straw fed ad libitum and enset (Ensete ventricosum) pseudostems or corms offered at 107 and 165 g/d respectively. Desmodium hay offered between 100 and 300 g/d tended to increase DM intake by up to 200 g/d with pseudostem, and this was significant at the 300 g/d level. The DM and OM digestibility of the diet increased when more than 100 g/d of desmodium hay with enset pseudostems was offered, but no difference was observed with enset corms. Nitrogen retention was higher with pseudostems supplemented with 300 g/d of desmodium hay and with corm supplemented with 200 g/d of desmodium (Nurfeta et al., 2010). Greenleaf desmodium hay offered to growing lambs (18 kg) as a supplement with maize stover significantly decreased the intake of maize stover from 28-38.5 g/kg W0.75 to 17-22.9 g/kg W0.75 when desmodium hay increased from 150 to 450 g/d (Said et al., 1993; Tolera et al., 1997; Tolera et al., 2000a). In one trial, the DM and OM digestibility of the whole diet either increased from 52 to 67% and from 58 to 71%, respectively, with increasing levels of desmodium hay (Tolera et al., 2000a). However, digestibility did not change in another trial (Tolera et al., 1997). Daily weight gain increased from 7 g/d with 250 g/d desmodium, to 25-44 g/d with 350 or 450 g/d desmodium, depending on maize stover quality. Lambs fed with maize stover alone lost 32 g/d (Said et al., 1993; Tolera et al., 2000a). Kanga'ra, J. N. N., 1993. Determination of tannin levels in multi-purpose Kenyan trees and fodder crops, their variation and effect on protein digestibility in ruminants. In: Thesis for Master of science degree, The Faculty of graduate studies, Department of animal science, The University of British Columbia, Vancouver, Canada. 83p.